For the atomic model, see Plum pudding model. For the novel by Nancy Mitford, see Christmas Pudding (novel). Christmas pudding is a type of pudding traditionally served as part of the Christmas dinner in Britain, Ireland and in some other countries where it has been brought by British emigrants. It has its origins in medieval England, and is sometimes known as plum pudding or just "pud", though this can also refer to other kinds of boiled pudding involving dried fruit. Despite the name "plum pudding," the pudding contains no actual plums due to the pre-Victorian use of the word "plums" as a term for raisins. The pudding is composed of many dried fruits held together by egg and suet, sometimes moistened by treacle or molasses and flavoured with cinnamon, nutmeg, cloves, ginger, and other spices. The pudding is aged for a month, months, or even a year; the high alcohol content of the pudding prevents it from spoiling during this time. Many households have their own recipe for Christmas pudding, some handed down through families for generations. Essentially the recipe brings together what traditionally were expensive or luxurious ingredients — notably the sweet spices that are so important in developing its distinctive rich aroma, and usually made with suet. It is very dark in appearance — effectively black — as a result of the dark sugars and black treacle in most recipes, and its long cooking time. The mixture can be moistened with the juice of citrus fruits, brandy and other alcohol (some recipes call for dark beers such as mild, stout or porter). Christmas puddings are often dried out on hooks for weeks prior to serving in order to enhance the flavour. This pudding has been prepared with a traditional cloth rather than a basin. Prior to the 19th century, the English Christmas pudding was boiled in a pudding cloth, and often represented as round. The new Victorian era fashion involved putting the batter into a basin and then steaming it, followed by unwrapping the pudding, placing it on a platter, and decorating the top with a sprig of holly. Initial cooking usually involves steaming for many hours. To serve, the pudding is reheated by steaming once more, and dressed with warm brandy which is set alight. It can be eaten with hard sauce, brandy butter, rum butter, cream, lemon cream, ice cream, custard, or sweetened béchamel, and is sometimes sprinkled with caster sugar. An example of a Great Depression era recipe for Christmas pudding can instead be made on Christmas Day rather than weeks before as with a traditional plum pudding, although it is still boiled or steamed. Given the scarce resources available to poorer households during the Depression this recipe uses cold tea for flavouring instead of brandy and there are no eggs used in the mixture. This recipe is not as heavy as a traditional plum pudding and it is still being cooked by Australian families. Many families now buy their puddings readymade from shops and they can be reheated in a microwave oven with a much shorter cooking time. There is a popular myth that plum pudding's association with Christmas goes back to a custom in medieval England that the "pudding should be made on the 25th Sunday after Trinity, that it be prepared with 13 ingredients to represent Christ and the 12 apostles, and that every family member stir it in turn from east to west to honour the Magi and their journey in that direction". However, recipes for plum puddings appear mainly, if not entirely, in the 17th century and later. Their possible ancestors include savoury puddings such as those in Harleian MS 279, crustades, malaches whyte, creme boiled (a kind of stirred custard), and sippets. Various ingredients and methods of these older recipes appear in early plum puddings. One of the earliest plum pudding recipes is given by Mary Kettilby in her 1714 book A Collection of above Three Hundred Receipts in Cookery, Physick and Surgery. There is a popular and wholly unsubstantiated myth that in 1714, King George I (sometimes known as the Pudding King) requested that plum pudding be served as part of his royal feast in his first Christmas in England. As techniques for meat preserving improved in the 18th century, the savoury element of both the mince pie and the plum pottage diminished as the sweet content increased. People began adding dried fruit and sugar. The mince pie kept its name, though the pottage was increasingly referred to as plum pudding. Although the latter was always a celebratory dish it was originally eaten at the Harvest festival, not Christmas. It was not until the 1830s that the cannonball of flour, fruits, suet, sugar and spices, all topped with holly, made a definite appearance, becoming more and more associated with Christmas. The East Sussex cook Eliza Acton was the first to refer to it as "Christmas Pudding" in her bestselling 1845 book Modern Cookery for Private Families. The pudding "had the great merit" of not needing to be cooked in an oven, something "most lower class households did not have". The custom of eating Christmas pudding was carried to many parts of the world by British colonists, and beyond the United Kingdom, became a popular and common a dish in the Republic of Ireland, Australia, New Zealand, and South Africa. Traditionally, every member of the household stirs the pudding, while making a wish. 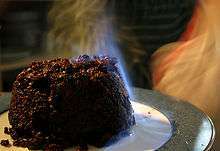 A Christmas pudding being flamed after brandy has been poured over it. "Stir up, we beseech thee, O Lord, the wills of thy faithful people; that they, plenteously bringing forth the fruit of good works, may by thee be plenteously rewarded; through Jesus Christ our Lord. Amen." The day became known as "Stir-up Sunday". Traditionally everyone in the household, or at least every child, gave the mixture a stir and made a wish while doing so. It was common practice to include small silver coins in the pudding mixture, which could be kept by the person whose serving included them. The usual choice was a silver threepence or a sixpence. The coin was believed to bring wealth in the coming year. Other tokens are also known to have been included, such as a tiny wishbone (to bring good luck), a silver thimble (for thrift), or an anchor (to symbolise safe harbour). "Mrs Cratchit left the room alone – too nervous to bear witnesses – to take the pudding up and bring it in... Hallo! A great deal of steam! The pudding was out of the copper which smells like a washing-day. That was the cloth. A smell like an eating-house and a pastrycook's next door to each other, with a laundress's next door to that. That was the pudding. In half a minute Mrs. Cratchit entered – flushed, but smiling proudly – with the pudding, like a speckled cannon-ball, so hard and firm, blazing in half of half-a-quarter of ignited brandy, and bedight with Christmas holly stuck into the top." Christmas puddings have very good keeping properties and many families keep one back from Christmas to be eaten at another celebration later in the year, often at Easter. Constance Spry records that it was not uncommon to go so far as to make each year's pudding the previous Christmas. ↑ "Plum duff updated". The Southland Times. Retrieved 2010-12-21. ↑ The Oxford English Dictionary cites this use as early as 1653 by John Lilburne and also, inter alia, in Samuel Johnson's Dictionary of 1755. ↑ Moore, S. (1999). We Love Harry Potter! : We'll Tell You Why. St. Martin's Press. pp. 84–86. ISBN 978-0-312-26481-9. ↑ "Christmas pudding". foodtolove. Retrieved 2015-12-26. ↑ Walsh, Simone "Quick and Easy Christmas Pudding Recipe", 14 December 2014. Retrieved on 9 August 2016. ↑ "Medieval Recipe Translations: Crustade". James L. Matterer. Retrieved 2008-12-23. ↑ Hieatt, Constance; Sharon Butler (1985). Curye on Inglysch. Early English Text Society. p. 133. ISBN 0-19-722409-1. ↑ Lepard, Dan (21 November 2011). "How to perfect your Christmas pudding". British Broadcasting Corporation. Retrieved 15 February 2016. ↑ Pool, Daniel (1993). What Jane Austen Ate and Charles Dickens Knew: From Fox-Hunting to Whist - the Facts of daily Life in 19th Century England. New York: Simon & Schuster ( Touchstone). p. 208. ISBN 0671882368. ↑ Gary Cleland (24 November 2007). "Home-made Christmas puddings die out". The Telegraph. Retrieved 30 December 2010. Wikimedia Commons has media related to Christmas pudding.